Global history, colonial history, early-modern history, Indian Ocean, Mughal India, early-modern Islamic empires, South Asian Islam, military history, history of globalization, intellectual history and Dutch Orientalism. Jos Gommans (1963) studied history in Nijmegen and Leiden. His PhD-thesis focused on the eighteenth-century horse trade between Central Asia and India which created an extensive informal empire dominated by Durrani, Rohilla and Bangash Afghans (The Rise of the Indo-Afghan Empire, 1710-1780, Leiden: Brill 1995; republished in paperback at Delhi: Oxford University Press 1999 and forthcoming with Manohar Publishers in 2018). This study raised new questions about the ecological and geographical dynamic of the longer-term interaction between India and its surrounding regions, be it along the frontiers of the so-called Arid Zone of Central Eurasia, or along the sea-lanes of the Indian Ocean to Southeast Asia. Along these lines Gommans prefers to take a global perspective, for example, by comparing and connecting the various relations between nomads and the settled empires of India, China and the Middle East. Meanwhile, he continued his research on the history of the Mughal Empire. Both these interests culminated in his monograph Mughal Warfare: Indian Frontiers and High Roads to Empire (London: Routledge 2002) which offers a fresh, geopolitical interpretation of the process of Mughal state-formation, including wide-ranging comparisons with other early-modern empires. The latest result of this perspective is a study on the legacy of the Turko-Mongolian warband to be published in 2018 in Prince, Pen and Sword, edited by Maaike van Berkel and Jeroen Duindam. In the same year, an omnibus of publications on the theme will come out in India under the title The Indian Frontier: Horse and Warband in the Making of Empires (Manohar Publishers). An important research topic remains Dutch cultural and social-economic interaction with South and Southeast Asia during the time of the Dutch East India Company (see e.g. the archival guide Dutch Sources of South Asia, Delhi: Manohar 2002 and two volumes in the Comprehensive Atlas of the Dutch East India Company). In this context, together with Piet Emmer, Gommans published a new synthesis (in Dutch) on the Dutch overseas empire, called Rijk aan de rand van de wereld: De geschiedenis van Nederland overzee 1600-1800, to come out in a revised English edition at Cambridge University Press in 2019. 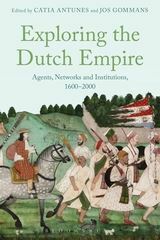 Together with Catia Antunes, he edited Exploring the Dutch Empire: Agents, Networks and Institutions, 1600-2000 in 2015. The years ahead, Gommans will focus more on early modern global intellectual history, in particular on what he perceives as a highly cosmopolitan courtly continuum between the North Sea and the Bay of Bengal. The first result of this new research focus will be a monograph on the entangled intellectual interaction between the Netherlands and India in the Country Series of the Rijksmuseum Amsterdam, to come out in 2018. From 2006 to 2009 Gommans served as editor-in-chief of the peer-reviewed Journal of the Economic and Social History of the Orient, is still editing the series Dutch Sources on South Asia and Colonial and Global History through Dutch Sources. He contributed regularly to the Encyclopaedia of Islam. Since July 2011 Gommans occupies the Chair of Colonial and Global History at Leiden University. Together with colleagues, he supervised the NWO-G Horizon Project (2011-2016) on Eurasian Empires: Integration Processes and Identity Formation: A Comparative Program as well as the COSMOPOLIS programme (2012-2017) which offers in depth academic training to (mainly Asian) historians who study the rich Dutch archives on Asia (and Africa), to be continued from 2018 onwards as COSMOPOLIS ADVANCED. Other projects that he coordinated include the LUF-funded programme on Indonesia, The Making of Religious Traditions in Indonesia: History and Heritage in Global Perspective (1600-1940) (2o12-2018) and the Erasmus Mundus programme on India, IBIES (Interdisciplinary Bridges for Indo-European Studies) (2012-2017). At present he also coordinates an archival project on the Dutch factory in Hirado based at Nichibunken, Japan, funded by the Ailion Foundation (IAAF). Apart from his work as a global historian, Gommans publishes occasionally on the local heritage and history of his native region De Peel. He is married and has one son. With L. Bes and G. Kruijtzer, Dutch Sources on South Asia c. 1600-1825. Vol. 1:Bibliography and Archival Guide to the National Archives at the Hague (TheNetherlands) (Delhi: Manohar Publishers. 2001). Edited with J. Leider, The Maritime Frontier of Burma: Exploring Political, Cultural andCommercial Interaction in the Indian Ocean World, c. 1000-1800 (Amsterdam: KNAW and Leiden: KITLV, 2002). Mughal Warfare: Indian Frontiers and Highroads to Empire 1500-1700 (London: Routledge, 2002). Hbk, Pbk, E-book. Edited with Om Prakash, Circumambulations in South Asian History: Essays in Honourof Dirk H.A. Kolff (Leiden: E.J. Brill Publishers, 2003). With Rob van Diessen, Grote atlas van de Verenigde Oostindische Compagnie / Comprehensive Atlas of the Dutch United East India Company, Deel VII: Oost Azië, Birma tot Japan / Part VII: East Asia, Burma to Japan (Voorburg: Asia Maior/Atlas Maior Publishers, 2010). The Unseen World: India and the Netherlands from 1550 (Amsterdam: Rijksmuseum and VanTilt, 2018).